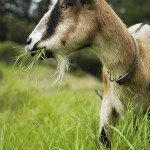 Uses of goat manure compost in organic gardening? As fas using the goat manure, that sounds great and will help the soil considerably. You may want to compost it before you spread it to reduce the smell, but other than the smell, you can use it directly.